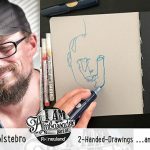 Did you know that two handed drawings are really helpful for everybody in the visual family? No? Then you should watch the talk with our Ambassador from Denmark, Jimi Holstebro.